Dropout; whose side are you on? Picture this: Andy is a student who joins a MOOC (Massive Open Online Course) on music history. He does this because he needs information on the rock ‘n roll era for his paper in college, which is covered in the first 3 weeks of this MOOC. He starts the course as scheduled and stops after 3 weeks. By then he has all the information he needs. April decides that, to progress in her job, she should have some knowledge on animal welfare legislation. Luckily there is a MOOC on government legislations that covers this in one of its modules. As planned, she watches all the videos on this topic to clear her deficiency on animal welfare legislation. Lastly, there is Ron, an unemployed wood worker, who is specialized in crafting wooden chairs. With too much time on his hands, he decides to start a new challenge by making canoes and joins a MOOC on handcrafting wooden canoes by Nick Offerman. He follows the whole course, but doesn’t fill in the quizzes and final test. He feels that his future hand crafted canoes will serve as a certificate. What do Andy, April and Ron have in common…… they didn’t complete the MOOC with a certificate. This means that from the perspective of the MOOC-provider, they are regarded as dropouts. Somehow that doesn’t seem right does it? They each had their own reasons to join a MOOC, their own personal goals on what they wanted to learn and they all reached these personal goals. To me that does not sound like the definition of a dropout, but a successful learning experience. What is happening here, is that a definition from the traditional (offline) learning context of high school, college and university (face-to-face) education is used in the context of online learning. 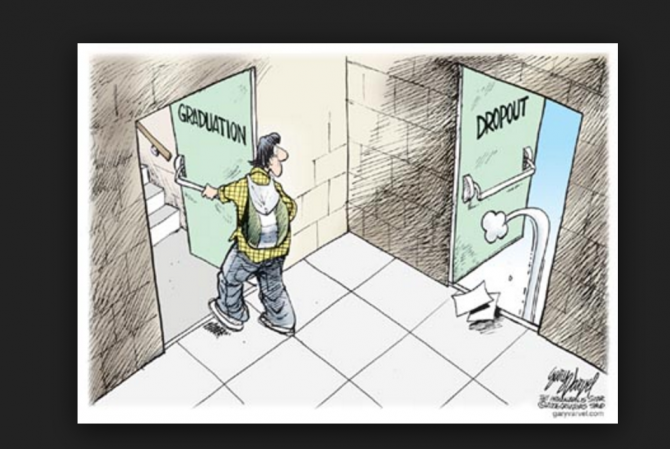 In general, a dropout is defined as someone who leaves education without a diploma/certificate (Tinto & Cullen, 1973). The education is usually compulsory until a certain age or level and involves tuition fees. Furthermore, it requires face-to-face in class time and involves certain entry requirements. This is typically the viewpoint of the educational institution. MOOCs on the other hand, as an online learning facility, are a totally different cup of tea. In general, there are no entry requirements and no tuition fees. MOOCs are flexible in place, time and pace and as long as you have functioning internet, available to anyone and everyone. Comparing these two flavors of education is like comparing apples with oranges or Star Wars with Star Trek. It’s just not done. Still, the main viewpoint in measuring success in MOOCs is from the MOOC-provider (aka educational institution); certificate driven. So, I say it’s about time that we start taking the student perspective in combination with the exceptional online learning environment into consideration, when studying online learning success and dropout. It is about time that we provide the online learning environment with it’s own definitions rather then keep using traditional educational definitions which just don’t fit the bill.